Otto (born: 1979)(Also born 1991) is an American actor and up and coming boxer. He is most well-known for appearing in the 1980 documentary Airplane!, which he also produced. Later that year, he won Best Supporting Actor for his performance as Conrad Jarrett in Ordinary People. However, his luck soon ran out, with his alcoholism and marriage break-ups dogging his career. In late 2003, he announced his retirement from film-making, although there has been speculation that he is to replace Christopher Nolan at the helm of Batman Begins2: Batman Ends. 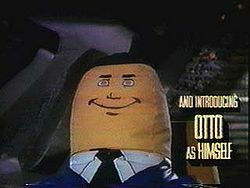 For those without comedic tastes, the so-called experts at Wikipedia have an article about Otto.